Weather: Overcast & dull, cold and dry – no good for photos! I waited and waited for some dry weather amid the January gloom. Finally a glimpse of dry weather was seen on the forecast and come rain or shine I set off for Malham on the edge of the Yorkshire Dales. My trip from Manchester took around 1 ½ hours. The walk took 6 hours, but I didn’t rush around today. The drive up to Malham was pleasant enough but the last 10 miles are on minor roads, so it was a little icy in places. There is a good car park at the entrance to the village. It charges £3.20 for a stay over 2 hours. I only had £2.40, and as it was mid winter I chanced that it was too cold for a traffic warden. Thankfully I was right. I couldn’t find anywhere open for change. It will be a different story in summer time, when it can become very busy at weekends. 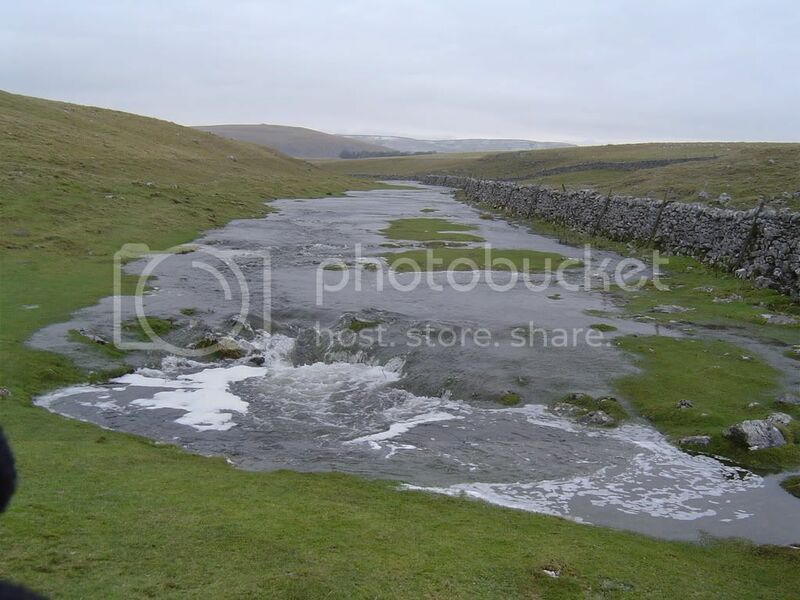 Once I was togged up against the cold I set off South on the Pennine Way path, which was submerged beneath Malham Beck in places – not surprising considering the amount of the wet stuff that has been pouring down recently. The paths are in good condition as there are a lot of tourists walking around here when the weather improves. Gordale Scar was hidden from view and it keeps its secrets until you walk up closer. As with Malham Beck there was a lot of water flowing down Goredale Beck (Both converge downstream to form the River Aire), which gave me some anticipation of what was to come. 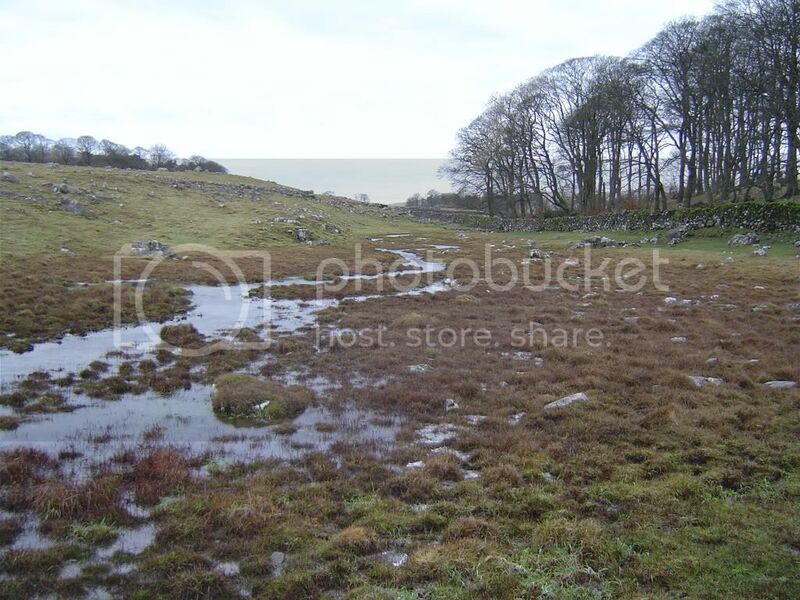 In the summer time there is a lot less water flowing here and the ground is usually good. All the paths are well trodden and clear to follow. There are some areas that are paved to prevent too much wear and tear. Further along the riverside path you enter Wedber Woods, which is a shady place in summer, with the Beck babbling along below you. Today I could hear the roar from further upstream! 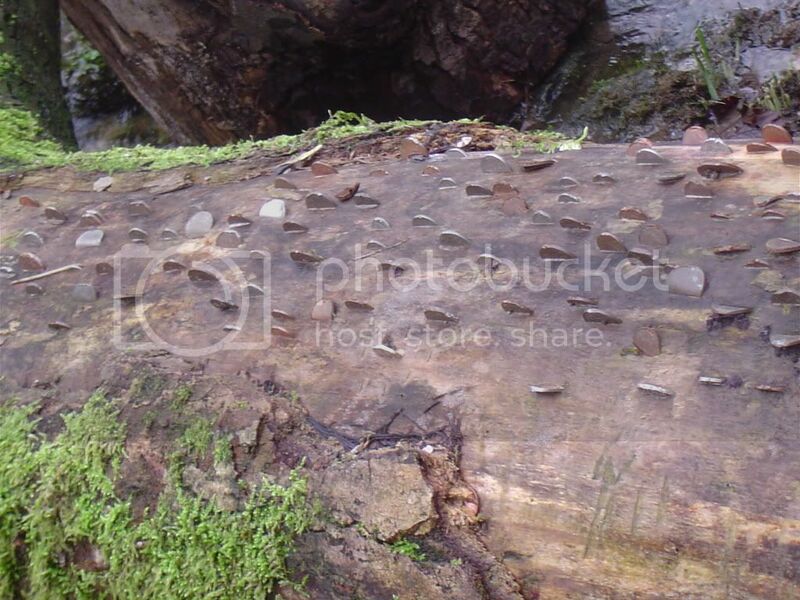 There are several fallen tree trunks that have been filled with coins that have been knocked or pushed in. Presumably to ward off the evil fairies of Janet’s Foss or provide change for the car park? The banks and rocks were very mossy due to the wet winter we have had, but even in summer it is quite humid walking through here. I could hear the roar of the waterfall before I rounded the bend to Janet’s Foss, and sure enough the water was boiling below the tremendous flow of water. 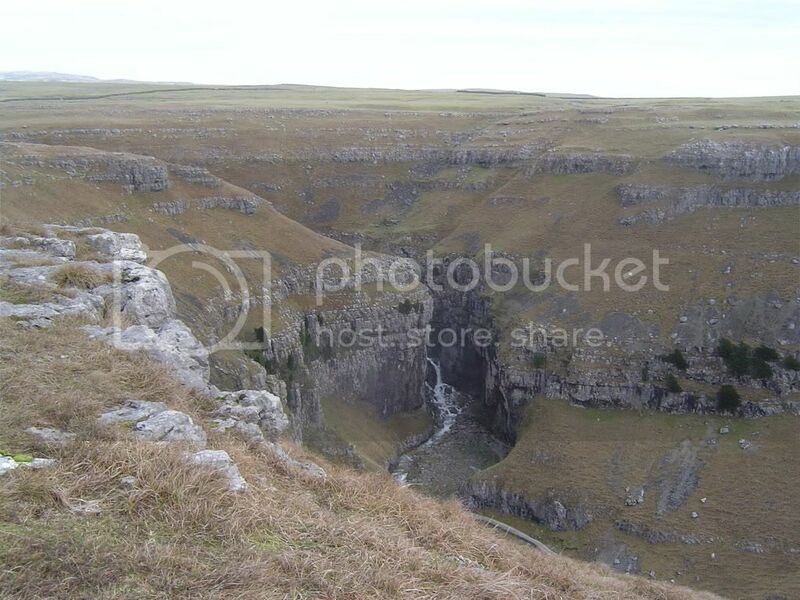 I wondered what High Force would be like today. 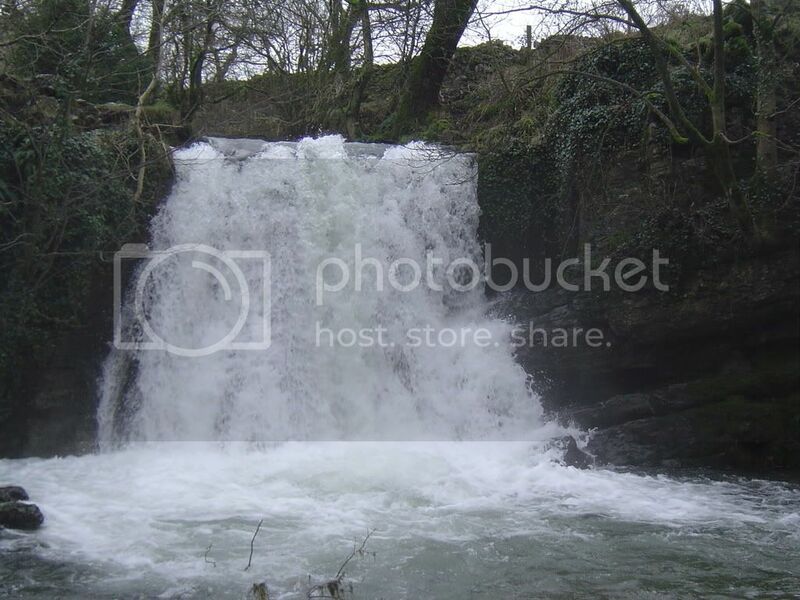 Janet’s Foss – Fairies behind? Foss is the old Scandinavian word for a waterfall or force. Legend has it that Janet was Queen of the local fairies, and lived in a cave behind the waterfall. In summer you can see the Tuffa screen that reaches the plunge pool below. Tuffa is a Calcareous deposit from water that has dissolved Calcium Carbonates from the Limestone – a bit like the deposits in the kettle in hard water areas. 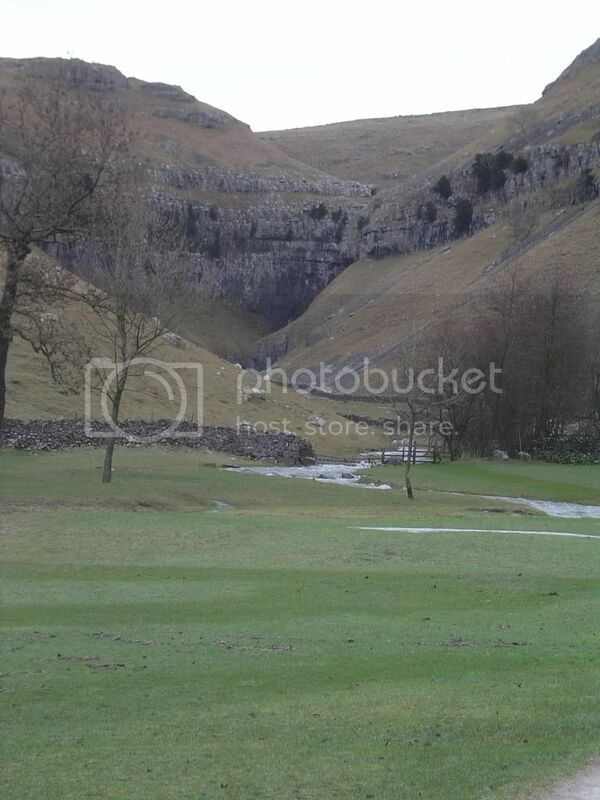 You will see more of it when in Goredale Scar. The very humid atmosphere around the fall favours mosses and ferns, but nice and cool in the summer to dip your toes. Be careful of the rocks, they can be slippery when wet – that applies to all of the Limestone rocks that you walk on this ramble. 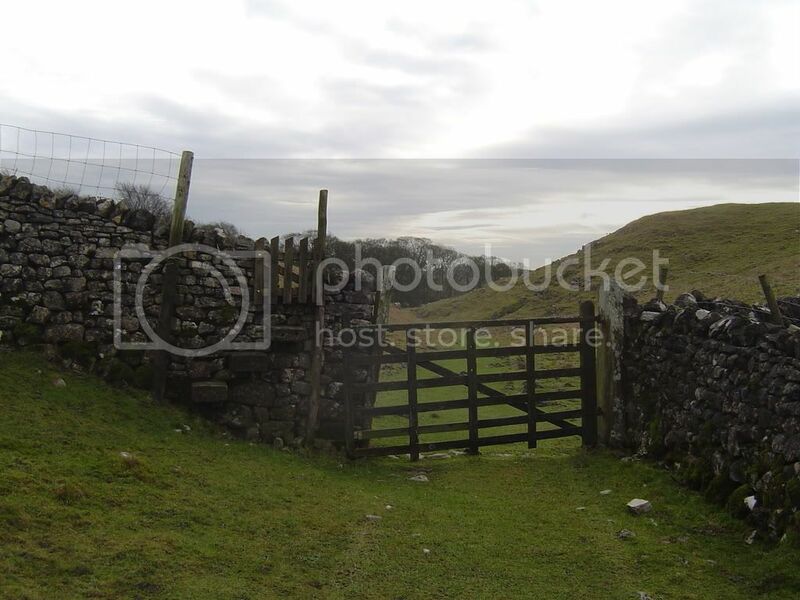 Once past the fall you emerge out onto a small road which leads up towards Goredale Scar. 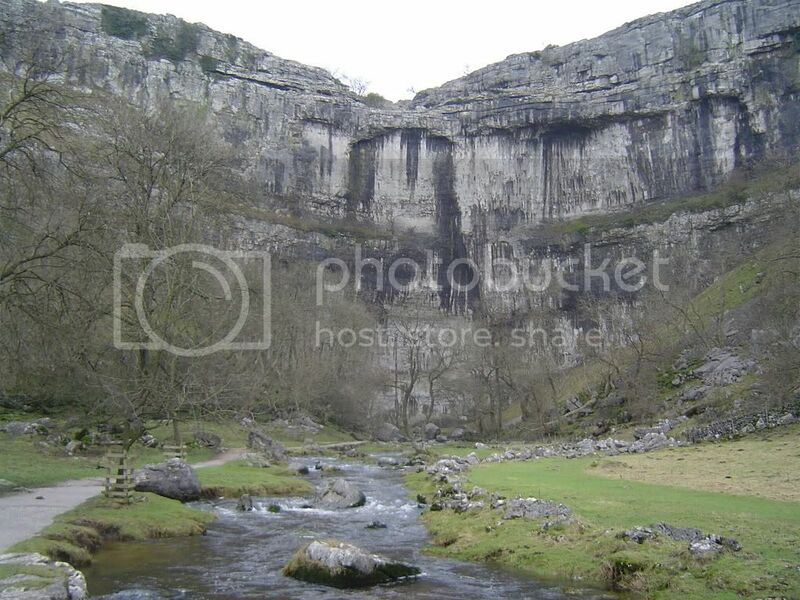 Pass by Goredale Bridge then start to appreciate the deep cut Limestone Gorge. As you walk towards the gorge you will start to hear the roar of the falls ( maybe not in summer time), and I knew today that I would NOT be climbing them. I passed a Dipper on the way bobbing up and down in the stream – dipping his head in the water looking for lunch. ”…every object conspires to produce one of the grandest spectacles in nature. The rocks dart their bold and rugged fronts to the heavens, and impending fearfully over the head of the spectator, seem to threaten his immediate destruction.” Edward Dayes 1805. Fancy words for saying the cliffs are high! 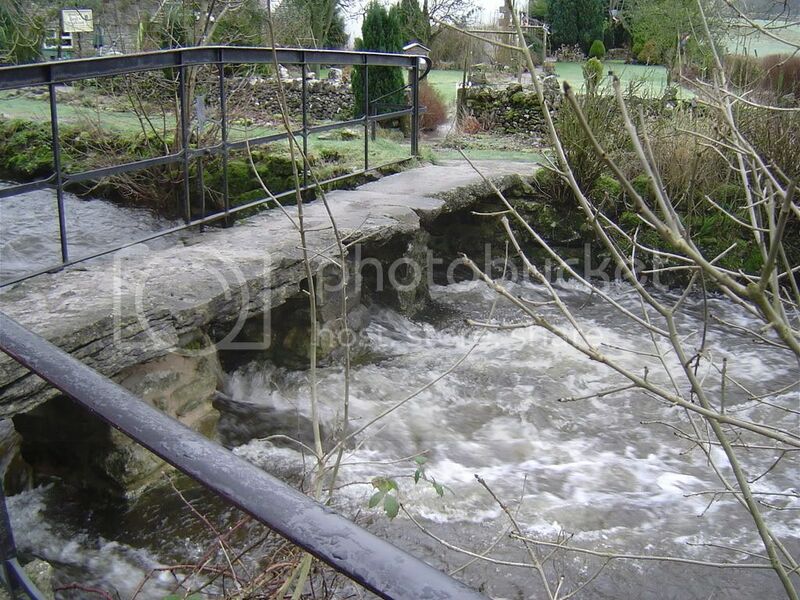 Anyway, no madness from me so I retraced my steps back to the bridge and crossed the torrent to walk on the path towards Malham. 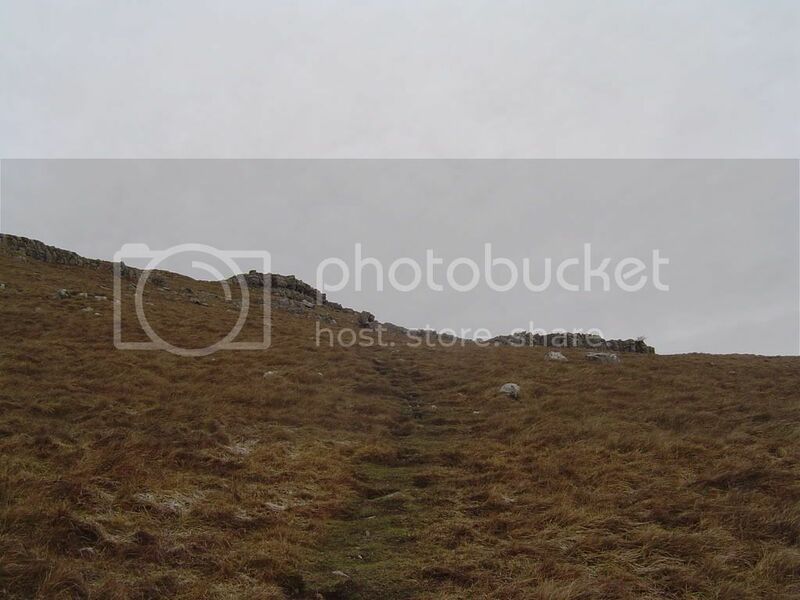 Walk up a gentle incline – notice the signs of old field systems and settlements, ridge and furrows. When you get to the first stile go through and immediately turn north to face the steep slope West of Gordale Scar. There is a gap in the dry-stone wall and you can see a path leading up the slope to the top of New Close Knotts. This is open access land and although there isn’t a path marked on the map you are free to use it. This was a stiff walk up the scarp slope, but if you pause for breath and enjoy the vista, you will notice how much of the old field systems are on show. 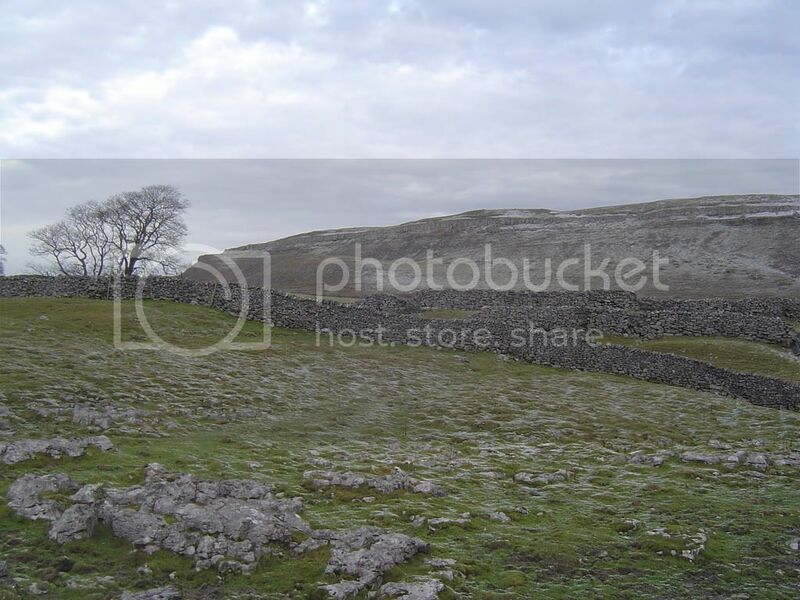 You can pick out the old field boundaries that predate the newer dry-stone walls. As you can see them so well defined they must have been used for many generations. The route up was quite slippery in places but this was due to the frosty ground. Again this path has been well trodden and in places there are a series of steps that makes the going easier. After a bit of huff and puff, your heart will be beating a good deal faster but the views from the top are worth it. 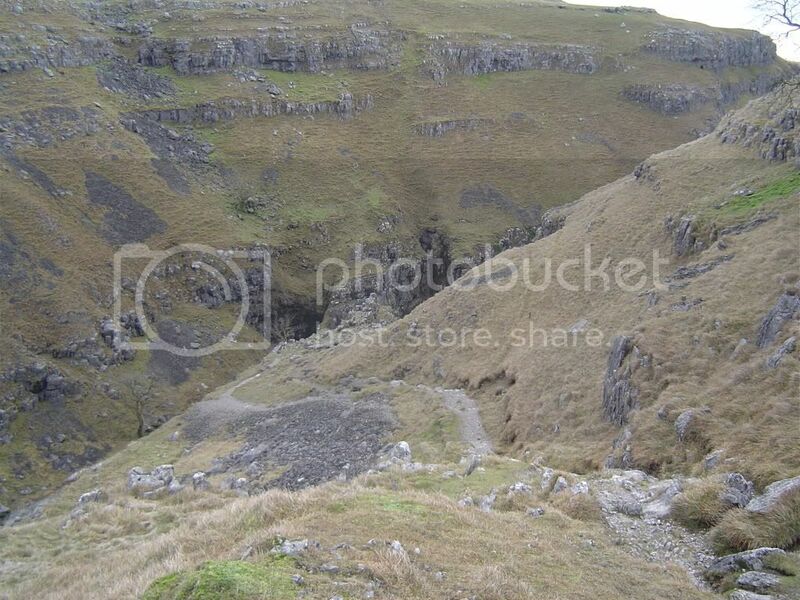 Here you can look down on Gordale Scar and see the deep cut of the gorge. Beware of the edge as it is a long drop to the valley below and there is no protection. 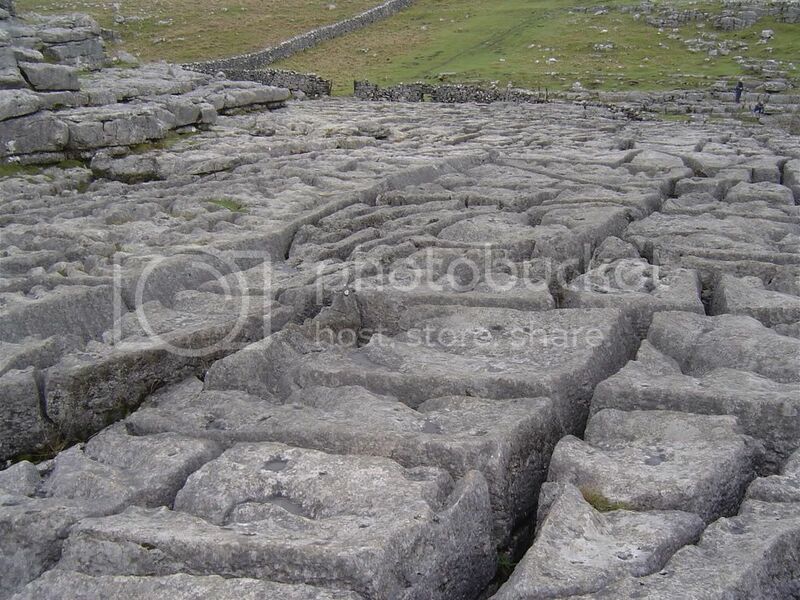 You are now at the Limestone pavement levels. Look ahead to easy paths and the bleakness of this landscape. Be aware that there are lots of wabbit holes dotted around so be careful where you plonk your feet. I walked along the tops looking down in to the deep valley formed from glacial meltwater, only a trickle of water down there in the summer time. There wasn’t much vegetation apart from close cropped grass along the paths, but if you inspect the Limestone pavement areas you would be surprised what grows down some of the Clints and Grykes (cracks between the pieces of pavement – some very big cracks!) I did pass a lonely tree that was leaning into the prevailing winds. If you look closely below its canopy you can see small water washed channels in the Limestone that form over many years from the drip drip of raindrops from the trees canopy. The scenery here is bleak in winter time, not much wildlife around, and the dusting of snow making it feel colder than it was. In summer time you will be squinting in bright sunlight from the glare off the Limestone – wear sunglasses and take plenty to drink.. I continued north towards Great Close Scar, a landmark to the East of Malham Tarn, on an easy track that stretches out for a mile or two. Passing the Tarn to the East, notice the boggy ground called the Great Close Mire. The name tells you all you need to know. 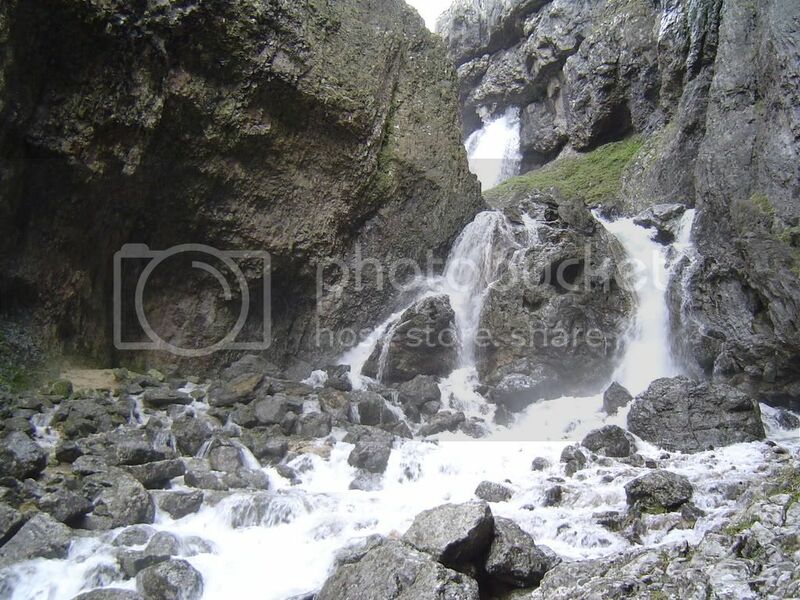 Today there was a plethora of small rivulets winding their way down to Gordale Scar feeding the main Beck. I followed the track up to Middle House Farm and then turned North-West at the highest part of this walk. It was pretty cold at this point so I didn’t hang around. I made good progress across the snowy landscape, mainly due to the frozen ground. It would have been boggy otherwise. I just skirted around the frozen puddles and Limestone bluffs along an easy to follow path. I wound down through a dry valley and stopped for some lunch. A nice cup of warming soup and a Turkey roll, followed by a PIE – well us northern boys love pies, and I did have one when I went to watch Manchester City last week. The Limestone pavements gave a nice sheltered spot for lunch and I had a nice warm seat, but I didn’t stop for long as the cold soon seeps into your bones on a day like this. 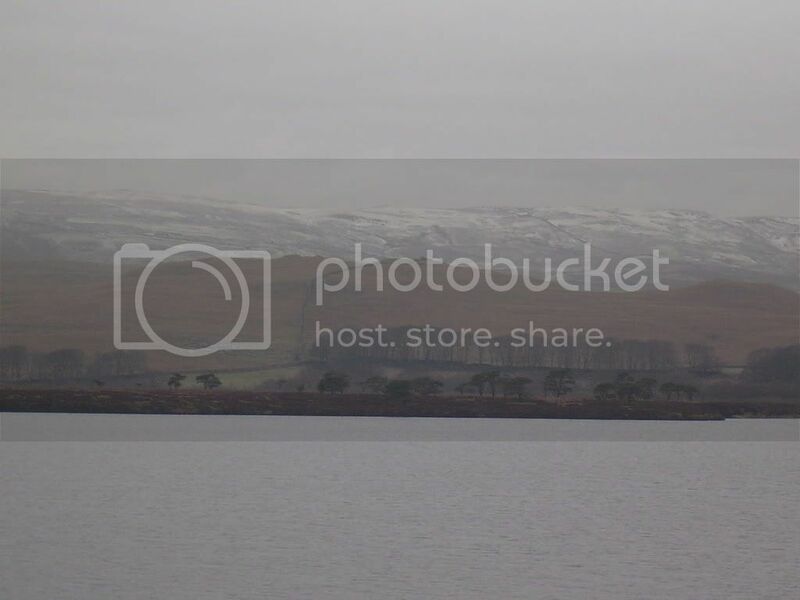 I had a good view towards the snowy tops of Fountain Fells, where the Pennine Way winds up and over. 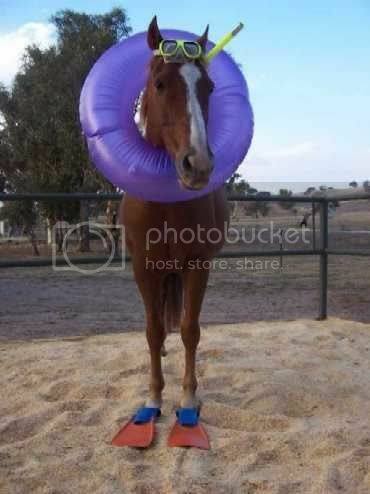 I wouldn’t like to be doing that in the winter. Once I felt refreshed I set off again and came to a fenced boundary (keeps the cows in the other side). 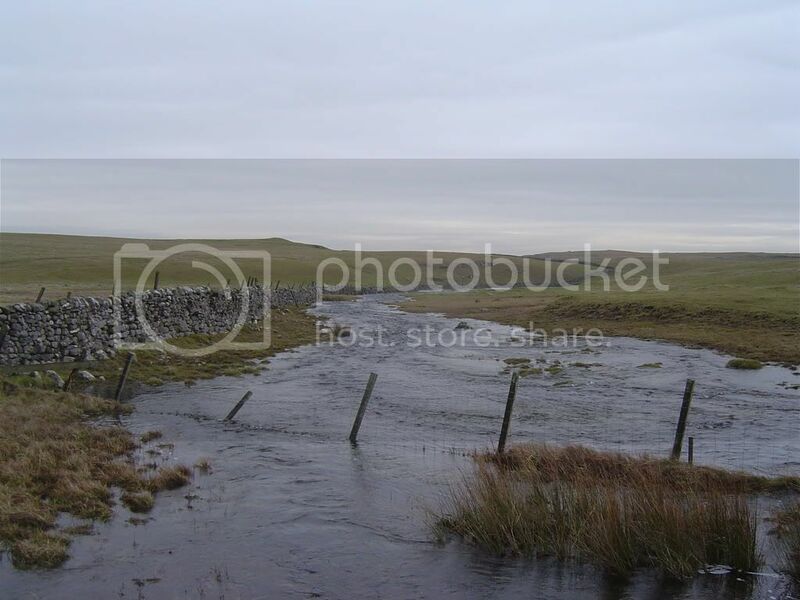 I had to walk up from the valley to find a way over without damaging the wall or the fence. I made my way down the dry valley onto Cowside and sure enough there were lots of a Hardy breed grazing away on the hillside – cows and bulls. 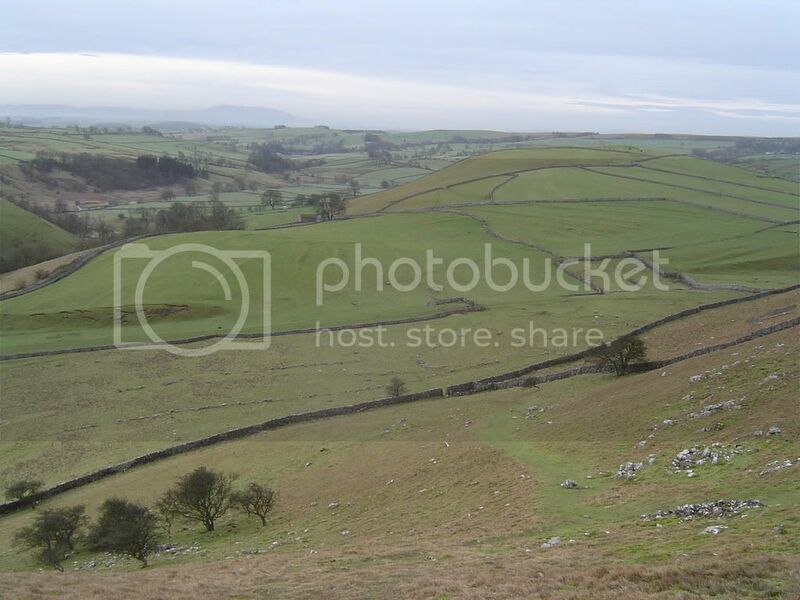 I dropped lower down the slope below them and then towards the South West contoured around the hill to meet up with the Pennine Way, which was signposted towards Malham Tarn. The Pennine Way. Note the gate on the stile…must be some smart sheep around..
Once again well trodden paths led down to the Tarn, and I followed a track that led around North side of the Tarn. I passed a bird hide from where you can watch a flotilla of Coots bobbing around. 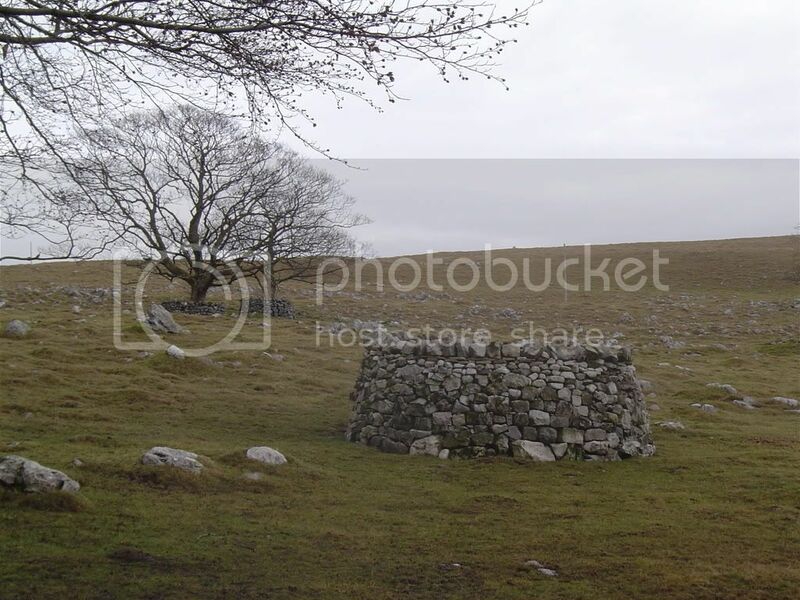 Further on is the Malham Tarn Field Centre, presumably where hoards of Schoolchildren carry out their Geography trips. A fine place to study. 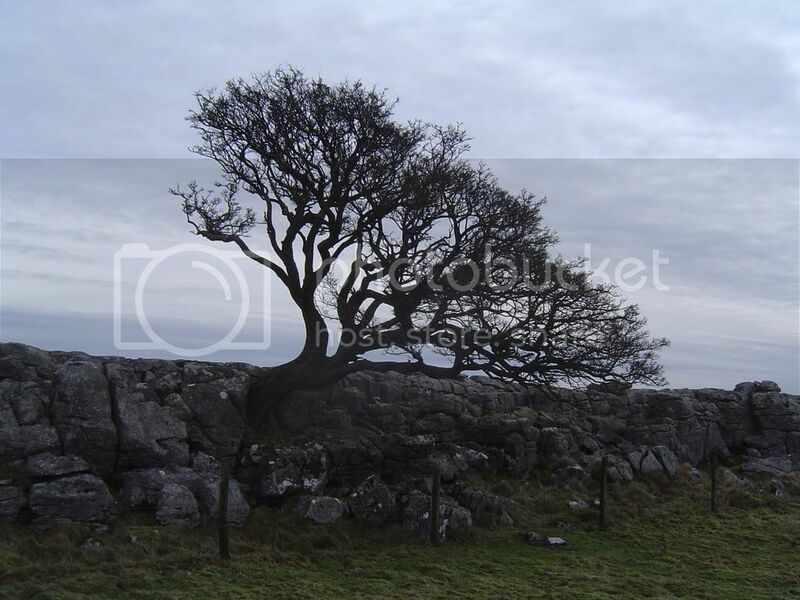 There are some round dry-stone walls protecting both young and old trees. It reminded me of some of the dry-stone walling seen in the Yorkshire Sculpture Park built by Andy Goldsworthy and his students. Last time I went the walls of the exhibition centre were sprayed with Cow S!^t. It smelt bad enough in March, what it smelt like in summer I couldn’t begin to imagine (it’s near Wakefield). I continued around the Tarn eventually reaching the outfall that spilled out into a shallow valley below. There was a good view back across to Tarn Moss, a boggy area fed from Fountain Fells. It is a protected Nature Reserve. But of all the rubbish photos taken today I thought this one had some merit. Tarn Moss in the foreground, Fountain Fells out the back. All of this goes into this…….. Beyond this sink the valley is dry, and the path becomes increasingly narrow and stony as it meanders down around Comb Hill. 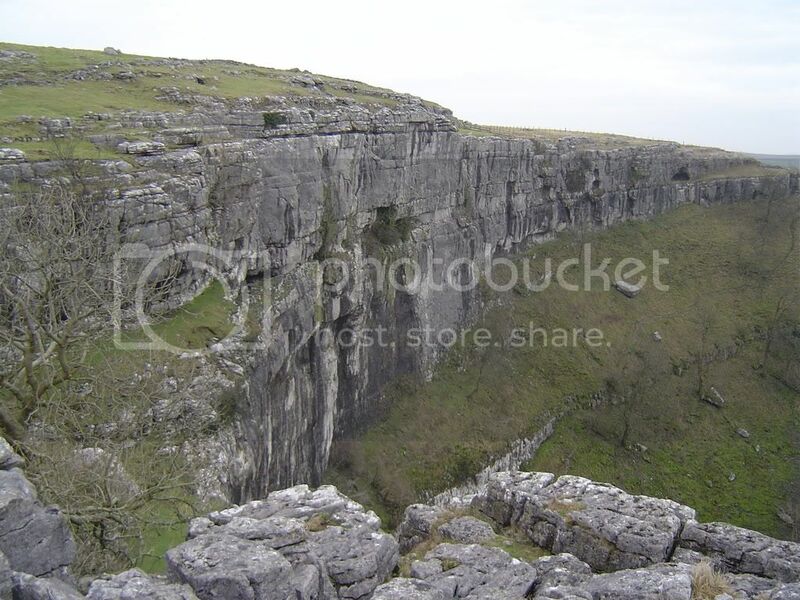 It arrives at the deep cut of Ing Scar, and you descend by a series of Limestone steps, no doubt slippery in the rain. But so are stockbrokers and car dealers, so take care. Ing Scar. The steps down are to the right. 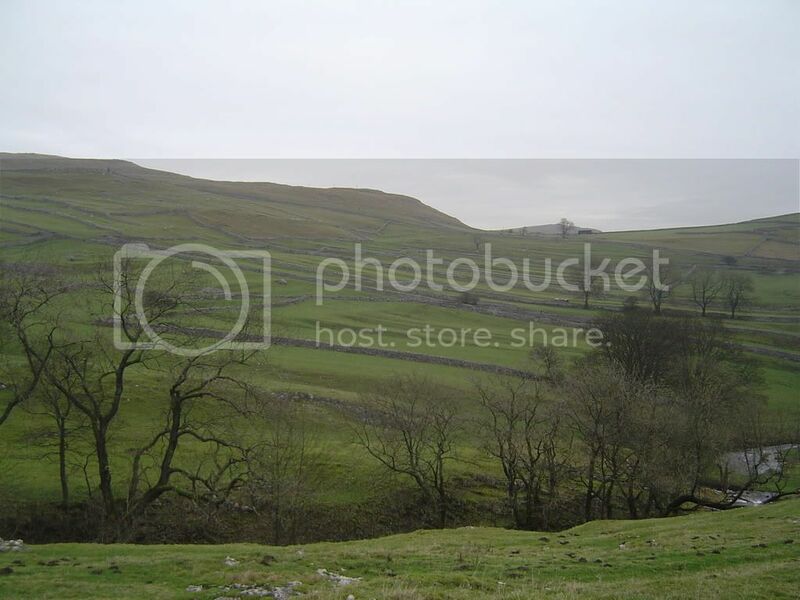 I made my way down towards Malham Cove, sheltered away from the wind, very peaceful. There were signs of old settlements again. 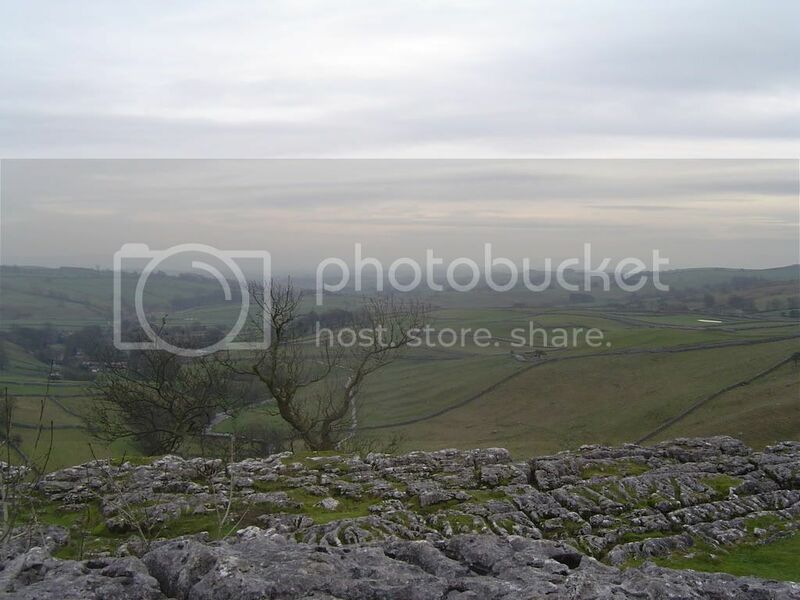 Eventually you arrive at the spectacular Limestone pavements above Malham Cove. It is a big drop to the cove below and there is no fence to keep you safe, so keep your eyes open. You have wide ranging views to the South, but I didn’t as the light was poor. But you get a good view of the old field systems and old settlement patterns. The ridge and furrows looking like the ribs of a starving animal of some sort…probably. 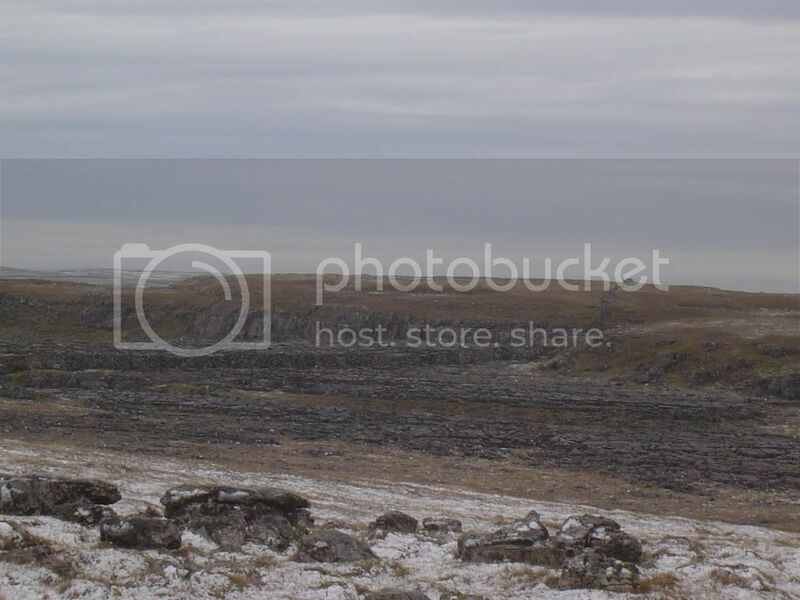 The Limestone pavement is widespread here and apparently without vegetation. But when you are on it you will notice a surprising variety growing amongst the Grykes. Clints are the blocks of limestone that constitute the paving, their area and shape is directly dependant upon the frequency and pattern of grykes. Grykes are the fissures that isolate the individual clints. Geography lesson over. Needless to say there are some very interesting shapes that have formed over the years by groundwater, before the soil had been scoured clean away by retreating glaciers last week- it's been cold - I mean the last ice age. You cross the pavement to your right side (West) and a steep flight of Limestone steps will take you down to the cove below. 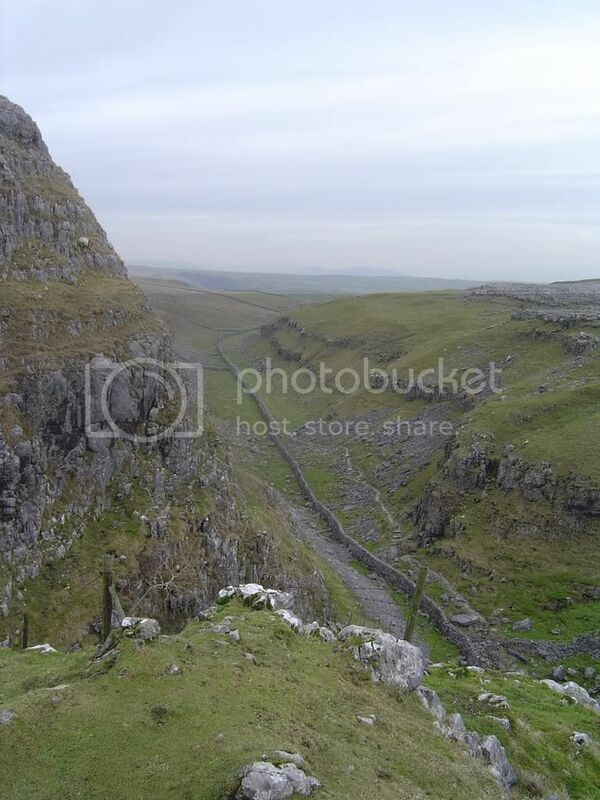 The path from here will take you back to Malham, look back to the cove and you can see the water seeping below the cove. 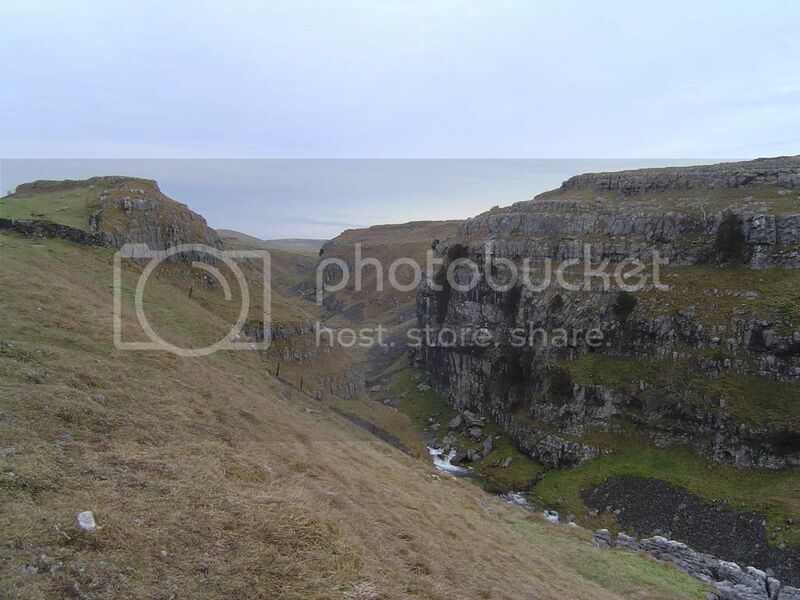 In summertime you may see some climbers dotted around the cliffs, usually to the right side. The path into Malham Village is very well maintained as this is the tourist track and becomes heavily populated at weekends. The old settlements and field systems are well defined here, and are thought to date back as far as the 7th Century, where Old MacDonald lived. EIEIO.